Nolato's Johan Christiansson said medical is more stable than telecommunications. SHANGHAI—Swedish injection molder Nolato A.B. is building a dedicated medical manufacturing plant in China with the capacity for 30 injection machines. The company—which makes plastics, thermoplastic elastomer and rubber latex products—said it is responding to its customers in the medical and pharmaceutical industries expanding their operations in Asia. Located near the company's existing plant in Beijing, the new factory will begin operation in the first quarter of next year, said Strategic Account Manager Johan Christiansson. 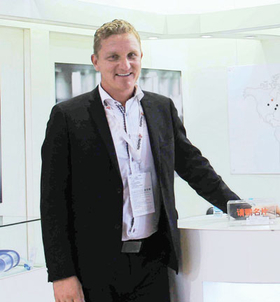 He discussed the project while attending the Medtec China trade show Sept. 25 in Shanghai. The Torekov, Sweden-based company said the new 23,700-sq.-ft. plant will have 8,600 square feet of Class 8 clean room space. "China is the fastest growing market for pharmaceuticals and medical devices, which means that more and more of our customers are discussing expanded production in China for the Asian market," said Christer Wahl-quist, president of the Nolato Medical business unit. The new facility will let the company separate its medical- and telecom-related manufacturing at its existing Beijing plant, which opened in 1999, Christiansson said. The old Beijing facility will focus entirely on telecom-related work, as the company tries to expand its medical-related business, he said. "The focus going forward is ... more and more on medical," he said. "Telecom goes up and down very fast. Medical is more stable." He said it made sense to separate the two businesses. "If you combine medical with something else there can be challenges," he said. "So to make sure we have the best conditions to manage this, we decided to have a dedicated medical site." The company also has a telecom factory in Shenzhen. Christiansson said the plant won't run at full capacity from the start: "We're building a little more for the future as well." Nolato said its medical business has been active in China since 2008. Globally, the company has about 270,000 square feet of clean room capacity for medical manufacturing, in a range of classes, at nine facilities in Asia, Europe and North America. Nolato's medical business worldwide has nearly 1,000 employees in Sweden, Great Britain, Hungary, the U.S. and China. The publicly traded company reported in July that its second quarter medical business worldwide rose 3 percent to $50.2 million, while overall sales climbed 11 percent to $180.9 million. Operating income increased 37 percent to $17.2 million. The sales hike was led by its telecom business, where sales in the quarter rose 28 percent, to $84.1 million.